Skepticism is not to be confused with cynicism. And healthy skepticism has nothing to do with optimism or pessimism. Healthy skepticism is a great quality in life, it means you don't take everything at face-value. Same is true in advertising. Most of the very best people I've met in advertising have a healthy skepticism. The people who, when someone tells them some supposed fact or claim, say 'Really?' and then proceed to investigate further. This road often leads you towards new thinking, or at least uncovering the real problem behind something. One of the most powerful forces in advertising and marketing over the last few years has been the influence of popular psychology. Famous scientists have published popular books particularly about human behaviour and the way our brains work. This of course is extremely interesting and relevant to people working in advertising and marketing, given that we are competing day-by-day for a slice of someone's brain. So any new revelation or theory is devoured and pored-over by ad folk and marketers for how it may help or influence what we do. This is all good so far. The problems start when people adopt some of these findings wholesale, and base entire advertising and marketing approaches on them. You can see how it happens, because often these books or findings are telling the advertising people what they wanted to hear. Highly ironically, they are suffering from confirmation bias. Interestingly, what many observers have noted is that a lot of these finding and theories tally with what a lot of people in advertising have always kind of thought. This shouldn't come a big surprise to us, as the best advertising people tend to have a strong grasp of 'what makes people tick' – just a basic, human instinct for understanding people. It's always important for us in advertising and marketing to remember to not take the latest pop science best-seller or exciting study as absolute, dogmatic gospel. Don't just lift it wholesale and base everything on it, just because it might tally with your own desire to do a certain kind of advertising. It's important because within the scientific community these theories and studies are constantly being questioned and peer-reviewed, and people are attempting to replicate the results (not always successfully). "The true heroes of science are not the technicians who are able to run an experiment on 50 people and squeeze out statistical significance, a book contract, and a TED talk. Rather, they are the people who refuse to take Yes for an answer, who test out their theories on hard problems and are willing to admit failure." Andrew Gelman, Professor of statistics and political science at Columbia University. Whilst scientists are rightly maintaining a healthy, balanced reaction to new findings, it's pretty bonkers that ad people are adopting them wholesale, and basing entire, multimillion pound advertising pushes on them. It's like advertising people are taking morsels of science and forming religions out them. So what's the answer? Well that's the interesting bit, isn't it? As Professor Brian Cox said recently (paraphrasing now) we never have 'the answer', we have a set of 'best theories at the moment'. I reckon the best bet is to read everything you can, arm yourself with all available information, definitely read Byron Sharp's How Brands Grow, for some actual marketing science (if you haven't already), and on top of it all, maintain that healthy skepticism. And don't forget your basic human understanding of what makes people tick. This article in Wired by Professor Andrew Gelman, inspired this post, and is well worth a read. 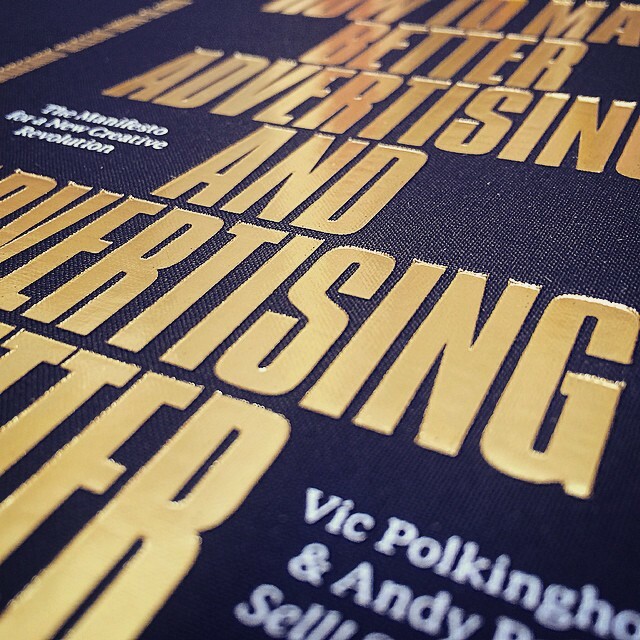 Our book How To Make Better Advertising And Advertising Better – The Manifesto For A New Creative Revolution (alt. title The Most Grandly Named Book In Advertising) is out now, and available exclusively at the Design Museum. It is suitably chock-full of healthy skepticism. Bob Ad Contrarian Hoffman says "It might be just the reset button we all need." So you want to improve advertising? Let’s start with the customer. Advertising agencies and marketers need to stop treating people as if they’re stupid, easily manipulated morons. Or empty-headed puppets who can be influenced by solely pulling on their emotional strings. Much current advertising is created without even a passing thought for what the actual benefit to the customer might be. This shows very little respect for them – acting as if people can be brainwashed into their decision-making, or won over with brainless advertising that exists only for entertainment value. People are not simply ‘consumers’ on a chart waiting eagerly to nod along with whatever we say or buy what we put in front of them. They’re real people. They are you, your mum, your best friend. They’re smart – certainly much more intelligent than most current advertising gives them credit for. Given the choice, they would quite happily do without advertising altogether, but if they have to be faced with it, they don’t want to be patronised or treated like idiots. They want, and deserve, to be treated as reasoning, intelligent beings. If we want to improve the quality and effectiveness of advertising, we need to start here. With marketers and ad agencies treating the customer with more respect.